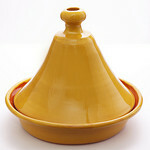 Tagine is the name of both the cooking vessel and the entree (kind of like our word for “casserole”). The entree tagine usually is made with tougher cuts of meat (lamb, beef) slowly simmered in a spicy sauce. This version replaces the meat with garbanzo beans and cauliflower. Cutting up all the vegetables and measuring all the spices in separate bowls before turning on the stove saves much time and frustration. Heat oil in a large skillet or braising pan over medium heat. Add onion and garlic, and sauté 2 to 3 minutes, or until onion is soft. Reduce heat to medium-low. Stir in chickpeas (including liquid), carrots, and all the spices (tumeric, cinnamon, cumin, red pepper). Cover and simmer 10 minutes, stirring occasionally. Add honey, raisins, and season with salt and pepper. Cover and simmer for additional 10 minutes, stirring occasionally. Garnish each serving with a dollop of yogurt (or omit if vegan), and sprinkle with cilantro if desired. Serve over couscous or rice or by itself to keep it gluten-free. Freezes very well. Best if eaten the next day so the spices can seep into the ingredients.